Polar C pictured going WD for a major at the Sunflower Kennel Club of Olathe show at 8 months old. 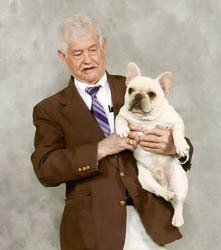 Polar C is a son of our "Bear", GCh House Of Tucks Polar Charlie. 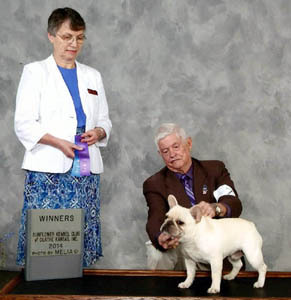 Polar C took back-to-back majors at the Sunflower Kennel Club of Olathe shows in Topeka and then another Major at the Tulsa shows a week later! He now has 11 points and 3 majors. Not bad for 8 months old! 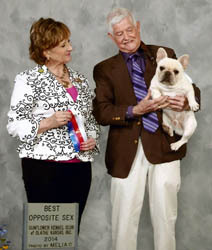 Copyright © 2005 - 2014 House Of Tucks French Bulldogs, Doherty Kennels & JLS Canine Services Web Design.